The Shoulder to Shoulder width is crucial for making wide necklines that don’t fall off the shoulder. It is also crucial for spacing the straps on corsets and bodices so that they stay on the shoulder and you don’t have to fuss with them all day. The Shoulder to Shoulder measurement is take from one shoulder point, across the body, to the other. The Shoulder to Shoulder measurement is taken from shoulder point to shoulder point. The point of the shoulder is where the bones are, basically. Optimally, it’s just a bit inside where your arm drops off (though that changes with time and poundage). Realistically, it’s the outermost solid part of the shoulder capable of bearing a strap or supporting a neckline. 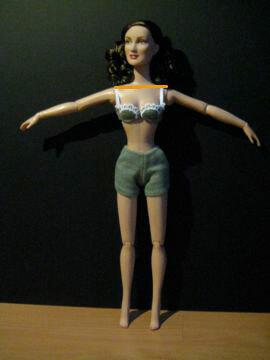 (I’ve seen women assume that their “problem” upper arms meant they had wide shoulders. This isn’t technically the case, and you’ll end up with your tops falling off your shoulder if you take the measurement across the torso at the widest part of your arms.) If your shoulder is more rounded and you’re not sure what area might be referred to as a point, you should be able to locate it by pressing your fingers into the flesh atop your arm and feeling for the mass where the shoulder bones come together. The Shoulder to Shoulder measurement should also be taken at the back of the body. Thank you for sharing this info… The last part about fitting the larger measurement is gold for me!. Now, by any chance do you happen to know if it is correct to derive the cross back from the chest circumference?. No, if you think about it, it’s not possible (and especially not for historical periods, where the natural torso is distorted – there are rules there, but they are proportions of the full torso measurements). I don’t think there’s an easily derivable relationship between front and back cross chest measurements that can be generalized for the average person. It depends a huge amount on posture and the anatomical position of the feminine assets.